The cracking and extraction products for Kazakhstan’s oil sand bitumen were determined by thermogravimetric analysis (TGA). By means of this technique, changes in the physical and chemical compositions of natural bitumen occurred during thermal treatment were assessed. The bulk composition was determined and the elemental content of resin-asphaltene compounds evaluated. Microspheres isolated from fly ash after the combustion of coals, were used to catalyze the cracking of natural bitumen. According to elemental analysis, natural bitumen is prone to produce coke formation. 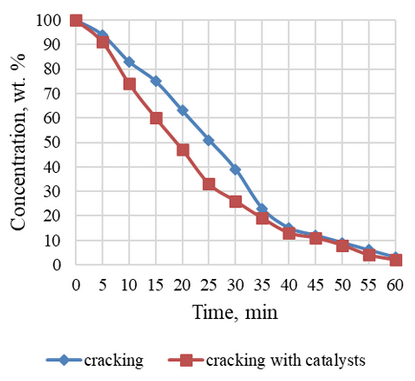 Catalytic cracking has a positive effect on the properties of the bitumen obtained from Munaily Mola field. The kinetic reaction orders and activation energies for cracking of natural bitumen were determined fitting the experimental data to an Arrhenius equation. The derived activation energies give insight on the nature of the pyrolysis kinetics of resin-asphaltene. Study of the specific reaction resin-asphaltene components in oil substances have and remains one of the most correct ways of knowledge of their chemical nature 1. However, most of the complexity and heterogeneity of these macromolecular components of heavy oil makes some problems in processing. Low thermal resistance hampered the possibility of individual reactions to the study of chemical reactions of resins and asphaltenes. Moreover, a series of reactions used successfully for the chemical characteristics of these petroleum heteroatomic components 2, 3. Study the mechanism and kinetics coking of heavy oil residue to clarify the conditions for obtaining high-quality coke. Authors 7, 8 demonstrated high selectivity NMR spectroscopy and TGA for the structural analysis of various oil macromolecular compounds. Application of this method to study bitumen fractions allowed in general to building their structure. Moreover, the use of the known data for the model compounds allowed giving a general characterization of bitumen aromatic part. For the characterization of fossil fuels, thermogravimetric analysis (TGA) provides an effective chemical analysis 8. TGA measures the mass loss of a sample subjected to a heating program under specific conditions in an inert (pyrolysis) or oxidative (combustion) atmosphere. This technique used extensively to examine thermal degradation in petroleum and its cuts, and for analytical purposes. Aim of this research work is investigating the reaction mechanism and understanding the thermal behavior of natural bitumen cracking products, also their calculating activation energy were performed. Thermogravimetric analysis of oil sand shows quantitative content of organic and mineral matters. Analysis of the curves in Fig. 1 revealed features of decomposition investigated bituminous minerals. In the region of 40-100 ?С fixed a small peak due, apparently, evaporation of volatile components. Intensive decomposition of organic matter is observed in the temperature range 400-570 ?С, with a maximum of 460 ?С, which is accompanied by a pronounced exothermic effect on the DTG curve. In the temperature range above 570 ?С markedly monotonous with low speed downsizing, continuing until the end of the experience associated with the decomposition of silicate and carbonate components of bituminous minerals. 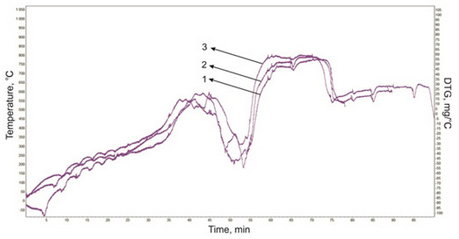 Heat treatment leads complete change in molecular structure of bitumen. Bitumen of Beke field is not deep cracked comparing with bitumen of Munaily Mola field. However, effect of catalyst for bulk composition of bitumen was insignificant. It can be explain by coke formation on the surface of catalyst. Asphaltenes are prone to coke formation at high temperature. Therefore, resin components of both bitumen is similar to cracked bitumen, difference of resin component 4 % bitumen of Beke field and 1 % bitumen of Munaily Mola field. Heat causes destruction of resin-asphaltene components to form a naphthene-paraffinic hydrocarbons and a small amount of gaseous products. The oil content increased to 61 and 83.6 wt. % of bitumens of Beke and Munaily Mola fields, respectively (Table 1). The main gas products of cracking include methane; its concentration is higher than 41 % upon the cracking of bitumen of Beke field or higher than 29 % upon the cracking of bitumen of Munaily Mola field (Table 2). Ethane, propane, and carbon dioxide also occurred in considerable amounts in the composition of the gas products of cracking. Small amount of hydrogen formed after heat treatment. Formation of hydrogen molecules testifies to the radical mechanism of the cracking reaction 8. Thermogravimetric analysis of cracked bitumen products from Beke field show the concentration of resin-asphaltene substances in raw petroleum products affects the ratio of gaseous and solid products in thermal decomposition. Conversion of bitumen in cracking judged by bulk composition of cracking products. Above temperature 350 °C, hydrocarbons conversion pass intensively, which asphaltene-resin components transformed into light hydrocarbons. Increasing of temperature in inert atmosphere mass of cracked bitumen declines monotonically (Fig. 2). Bitumen thermal processing increases formation hydrocarbons boiling below 350 °C. Light resin components produce sealing process, which increases sharply the proportion of asphaltenes in the total content of resin-asphaltene substances. Depth of this process occurs in the remains of the high-viscosity oil with a richer content of cyclic compounds. Maximum weight loss rate observed in temperature range 650-700 °C. Elemental data (Table 3), all samples of asphaltenes and resins show quite clearly the trend of the asphaltenes composition the higher the processing temperature, the higher the carbon content. The basic reaction is “carburization” asphaltene molecules at relatively high temperatures (400-450 °C) and dehydrocondensation of cyclic structures. This process can be explain by H/C ratio of asphaltenes. Oxygen, sulfur and nitrogen contents slightly decreases in cracking. High temperature is related to the cleavage of C-R (R=S, O, N) bonds. C-S, C-N and C-O bonds energy is lower in comparison to C-H and C-C bonds. Thermogravimetric curves of decomposition of liquid cracking products (Fig. 3) begins at a temperature ~ 270 °C and ends at a temperature 700 °C. The curves of all the samples are clearly visible cracking two areas decomposition temperature: 470-580 °C, with a maximum at 530 °C, and 600-700 °C, with a maximum at 630 °C, although visually curves differ from each other. All the experimental data indicate that the heat treatment (450 °C) resinous-asphaltene components both of natural bitumen are changing in two directions: dehydrocondensation to form a condensed polynuclear aromatic structures and large molecules cleavage 2-3 fragment. In the case of oxidation at relatively low temperatures is predominantly “burning” periphery molecules without substantial cleavage, i.e. without substantial degradation of asphaltenes polynuclear molecules. Cracking products and natural bitumen of Munaily Mola field start changes at temperature 200-300 °C in the high-viscosity plastic state, accompanied by a small endothermic effect (Figs. 4, 5). Intensive gassing from the liquid product observed after 290-300 °C, and the mass loss rate is almost linearly increases to temperature 600 °C. Apparently, at temperature 500-600 °C the dominant process is breaking weak chemical bonds, resulting in the formation of low molecular weight products. Changing the nature of the linear conversion speeds above 500 °C leads to intensive thermal degradation of the main structural units of asphaltenes compounds. A number of successive endothermic effects characterize the process of asphaltenes thermal transformations. These are temperature ranges coincide with the stages of thermal decomposition derived from thermogravimetric data. The results of the thermographic studies are suggesting the basic laws of thermal transformations of resin-asphaltene components. - In the first step of heat treatment in the temperature range 300-400 °C occurs delamination of structural units, and the allocation of the resin components forming the radicals at the weakest rupture β- and γ-bonds with respect to the aromatic ring (weight loss 10-12 wt. %). In system, very limited mobility of radicals formed in the asphaltene particle and their delocalization and shielded in this temperature range. Chain process can developed only through the separation of alkyl (methyl) substituents. A suitable spatial arrangement of the processes of intramolecular cyclization may occur. The most probable processes leading to chain termination are recombination and delocalization (stable radical formation). - Second stage of pyrolysis at 400-500 °C shows detailed flow dealkylation process, destruction of molecules formed in the first step by recombination reactions and intermolecular condensation of intra- and coke formation process. Simultaneously starts the reaction by disproportionation and dehydrogenation of associated hydrogen atoms. It is know that if the hydrocarbon reacts readily with the radical recombination, the redistribution reaction of hydrogen proceeds at a higher rate than the proton separation. Redistribution of hydrogen on aromatic hydrocarbons during thermal exposure have a low affinity for the radical (naphthalene, phenanthrene) does not occur, it is rather dimerization. Therefore, all reaction leads to сondensation of polycyclic aromatic hydrocarbons, then formation of carbides and coke. The reaction pathways favor the formation of the most stable radical species, which for alkyl free radicals is in the following order: tertiary > secondary > primary hydrocarbons. Free radicals are present only at low (though measurable) concentrations during thermal reactions, but they are nonetheless crucial participants in the chain reactions of hydrocarbons 8. After our previous studies 13 were an attempt to build the molecular structure of resin-asphaltene components of natural bitumen. 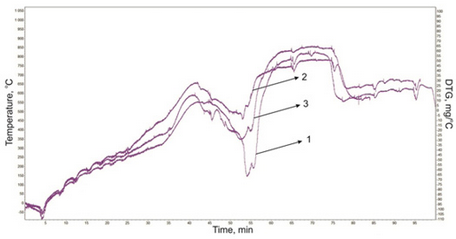 These analyses allow to present approximate direction of reaction at high temperature. Formation of free radical in cracking is complex system. At first high temperature leads to the rupture of weak bonds in a molecule or intermolecular forces. This can be long alkyl chains (from C4 to C8 of different structures iso- or normal). The main radical in system is carbocation. Then these free radicals attack heteroatoms bonds or react with the opening of a cyclic compound. The graph (Fig. 6) give information about the fundamental reactions of aliphatic free radicals and can help to interpret and predict selectivity in the reactions of complex mixtures. Despite the large number of reactants and the importance of seconder reactions, thermal cracking of bitumen normally follows apparent first-order kinetics to a good first approximation. Large molecules undergo thermal cracking, many products are possible but a limited set of reaction pathways will normally dominate. Although each step in a free-radical chain reaction is simple, the overall network of reactions is complicated, especially for a complex initial mixture such as bitumen. The reaction scheme for cracking even a simple compound is daunting. The reactions speeds for a complex mixture are therefore difficult to define in steps of elementary reactions. Nevertheless, the series of reactions follow the known chemistry of related processes such as thermal cracking of n-alkanes, cracking of model compounds, liquefaction of coal and conversion of residues. This series of reactions presents a consistent scheme for the thermal cracking and addition reactions of the components of bitumen, except for the hydrogenation or dehydrogenation of aromatic rings. Table 4 summarized some of the available data on cracked bitumen. The reported activation energies are in the range of 223-576 kJ/mole, but the upper end of this range is more consistent with the cracking of C-C bonds. This data set displays a partial “compensation effect”, in which a decrease in activation energy is offset by a decrease in the pre-exponential factor. In general, the activation energies defined based on boiling point and are higher, which based on solubility fractions. The net disappearance of an asphaltene fraction (such as occurs during solubility separations) includes reactions and physical processes other than bond breakage, contributing to an unusually low activation energy. When physical processes such as solubility and diffusion affect the mass of a lumped component, then the apparent activation energies tend to be much lower than for thermal cracking reactions alone. These physical properties normally have much smaller temperature coefficients than chemical reactions. The oil sand samples that studied in this work were collected from Western Kazakhstan. The employees of the geological exploration «Altyn KDT» company (Kazakhstan) represented the oil sand samples. Two types of oil sand used in these experiments from Beke and Munaily Mola fields. Both samples were output from ground surface of oil sand deposits (field). Extraction of natural bitumens from oil sands were carried out in Soxhlet apparatus, trichloromethane (purity 99.5 %) used as solvent. The amount of extracted natural bitumen from oil sands of Beke field is 12 wt. and Munaily Mola field is 16 wt. %. In order to determine the initial bitumen content in the feed, 3 g of vacuum tower bottoms was diluted with 150 ml of trichloromethane and mixed for 2 h, then vacuum filtered with filter paper. The filter paper washed and dried to determine the weight of fine solids. All analyses were repeated 3 times. The main components of oil sands’ mineral part are quartz and feldspar constituting up 80-90 % of the weight of the breed. Main components obtained in analysis were sandstone, interspersed with thin layers of clay and siltstone. The activation energy is an excessive amount of energy, which must have a molecule to start the chemical transformation. K - the rate constant; T - temperature of the process; CK - a constant magnitude; R - universal gas constant, equal to 0.0083 kJ/mol?K; E - activation energy of the reaction. To determine graphically the activation energy of the initial DTG branches of the curve peak randomly selected 8-9 points. For each of them with a ruler measure the distance to the base line. For each of them determine the temperature (t, °C) by projecting the curve T. The found values are entered into the table and spend their mathematical processing. The schedule should provide direct, on the tangent of the energy that the inclination angle is calculated activation energy E, kJ/mol. As the catalyst for cracking, microspheres, isolated from coal combustion fly ashes, were employed 9. The samples of microspheres were separated under laboratory conditions from magnetic concentrates obtained upon the dry magnetic separation of fly ash from the combustion of powdered brown coal. Table 5 summarizes the chemical composition of microspheres catalysts. From table data, the iron oxide forms determine catalytic properties of microspheres. It was experimentally established 10 that an optimum quantity of catalysts for an increase in the degree of destruction of the resin-asphaltene components of heavy hydrocarbon raw materials is 10 wt. %. 7 g bitumen samples were put into cracking reactor, then heated up bitumen at temperature 450 °C for 60 min. After conducting the heat treatment of bitumen, the yield of gaseous products was determined based on the weight loss of the reactor with the sample after the removal of gaseous products from the reactor. After the removal of liquid products, the reactor washed with solvent and weighed. Thermogravimetric analysis of cracking products carried out in an atmosphere of air on a MOM derivatograph (Hungary), which makes it possible to measure the weight loss of an analytical test sample with increasing the temperature to 1000 °С at a heating rate of 10 °С/min. After analysis, derivatograph cleaned with argon as inert gas. The group composition of the initial bitumen and the liquid products of cracking determined in accordance with a procedure (STP SZhShI 1217-2005 procedure, Institute of Petroleum Chemistry). Including asphaltene content of the sample determined by the cold Holde method. The concentration of resins in the resulting oils determine by an adsorption silica gel method; the mixture was placed in a Soxhlet extractor, and the hydrocarbon components (oils) and resins were sequentially extracted with n-hexane and an ethanol-benzene mixture in a ratio of 1:1, respectively. Elemental analysis of samples (CHSNO) determined by elemental analyzer Vario MICRO cube (Germany). The gas composition of the cracked products determined by gas chromatography on a Khromatron chromatograph. The С1-С6 hydrocarbons were separated by gas-liquid chromatography and the nonhydrocarbon components (hydrogen, nitrogen, and oxygen) by gas-adsorption chromatography. All analysis conducted under isothermal conditions simultaneously on two columns. The thermogravimetric characteristics of the Kazakhstan oil sand samples were studied in this research work. It is established that heat treatment in stationary conditions of natural bitumen of Beke field leads to destruction of no more than 28 wt. % of resins and 10 wt. % of asphaltenes. The destruction of resins is no higher (13 %) at thermolysis of bitumen of Munaily Mola field, the content of asphaltenes decreased by half comparing with initial data. It has been shown, that the presence of ferrospheres in the cracking process has a similar effect on the different natural bitumen, the destruction of resin increases by 13 % for bitumen of Beke field and 32 % for bitumen of Munaily Mola field. Elemental analysis, bulk composition and TGA allows presenting the chemical mechanism of the cracking of bitumen. The increasing of activation energies may be related to the different chemical composition of bitumen and interaction between resin and asphaltene components.